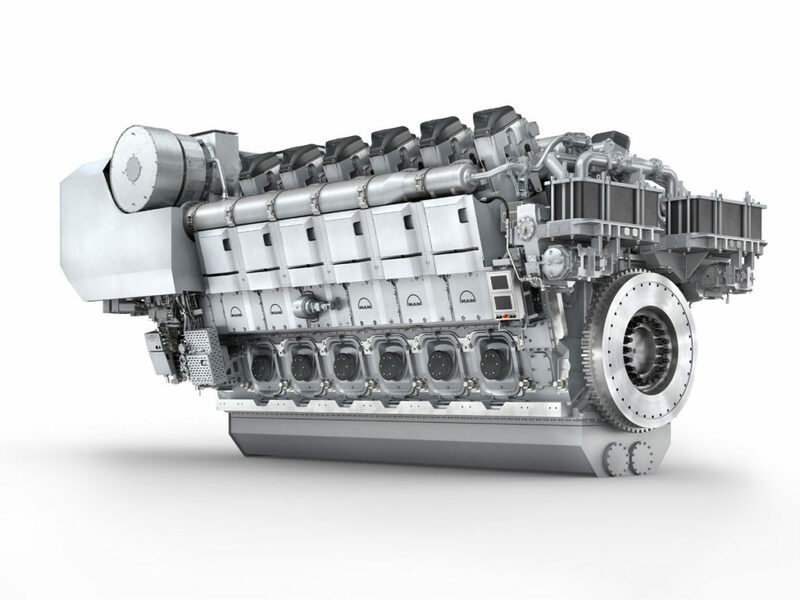 MAN has revealed the successor to its 48/60CR engine in the company’s 4x line of high-performance diesel engines. The MAN 45/60CR marine diesel engine will initially be available as 12V and 14V versions that boast power outputs, of 15,600 and 18,200 kW respectively, with inline versions following at a later stage. For land-based power generation applications, MAN has developed the maximum power version, the 20V45/60 with 26 MW. MAN Diesel & Turbo states that the 45/60CR’s power increase and low consumption are particularly aimed at such key, lifecycle-cost-oriented applications as cruise liners, RoPax ferries, RoRo vessels, and dredgers. The company is making the 45/60CR engine available first as 12V and 14V versions with 6L to 10L variants to follow later. It reports that the engine has been conceived from the beginning as a family concept that will accommodate future derivatives, for example, such as a dual-fuel derivative. The first set of V-type engines will be available from end-2020 with delivery of the first L-type engines due from 2022. The new engine is also a new centerpiece of MAN’s extended systems approach which reflects in the company’s latest generation digital Safety and Control System, SaCoS 5000. Following a decentralized design concept, SaCoS 5000 offers unprecedented data availability and optimized alarm visualization and diagnosis. “Thanks to the new SaCoS, the MAN 45/60CR is not only online-ready but also equipped for the digital future of power generation”, stated Stiesch. Modern shipping faces constant demands to increase efficiency and comply with ever more stringent emissions regulations, amid growing public awareness of its environmental role. The MAN V45/60CR engine enables owners and operators to meet such demands, while simultaneously optimizing operating expenses with unrivaled, low levels of fuel-consumption. Through increasing standardization and using modular sub-components, the new MAN V45/60CR engine also allows faster installation and easier maintenance. The new four-stroke unit meets IMO Tier II, while IMO Tier III is met with MAN’s in-house, compact SCR system; the engine is shortly scheduled for approval by all major classification societies. The 45/60CR is suitable for use in a wide range of marine applications, especially applications with high power-demands like ultra-modern cruise vessels, large RoPax and RoRo ferries, as well as mega-dredgers. Its primary focus is on reliable power generation, performance flexibility and superior efficiency in either diesel-electric or diesel-mechanical configurations. Calculations, based on a representative load-profile of a cruise vessel, show that a ship operating with an MAN 45/60CR engine can enjoy a fuel-oil cost benefit of 5 to 12% in comparison with a vessel powered by an equivalent engine from other manufacturers. For a cruise vessel of around 120,000 – 150,000 gross tonnage with 60 – 65 MW of installed power and an assumed fuel price of 500 EUR/t, this translates into annual savings of 0.9 to 2.4m EUR when employing the 45/60CR. The new engine combines the proven characteristics of its predecessor – the MAN 48/60CR – including its in-house common-rail injection system, with the latest innovations in diesel-engine technology such as two-stage turbocharging as previously mentioned here. The MAN V45/60CR can also be combined with the innovative MAN ECOMAP 2.0 technology that grants operators the flexibility to run an engine following different SFOC power characteristics, facilitating optimal efficiency at different load points. The latest development with this innovative technology is the integration of the MAN SCR system into ECOMAP, offering even further possibilities to optimize the efficiency of the propulsion system, taking into account fuel and urea prices. operational flexibility, and completely new opportunities for optimal economic operation – regardless of prevailing consumable prices.